Wild things in the world of pop this week. The FBI released the closed-as-of 2005 case documents on Chris “Biggie Smalls” Wallace, Pandora was caught selling out personal user information and user locations for dubious gain, Edward Ebert of the Magnetic Heroes released some hippie musings, and Sundial’s debut LP Never Settle is being re-released. Now that your nostalgic glands have been jogged, let us look ahead while seeing what else we missed from this week in pop, in no particular order. 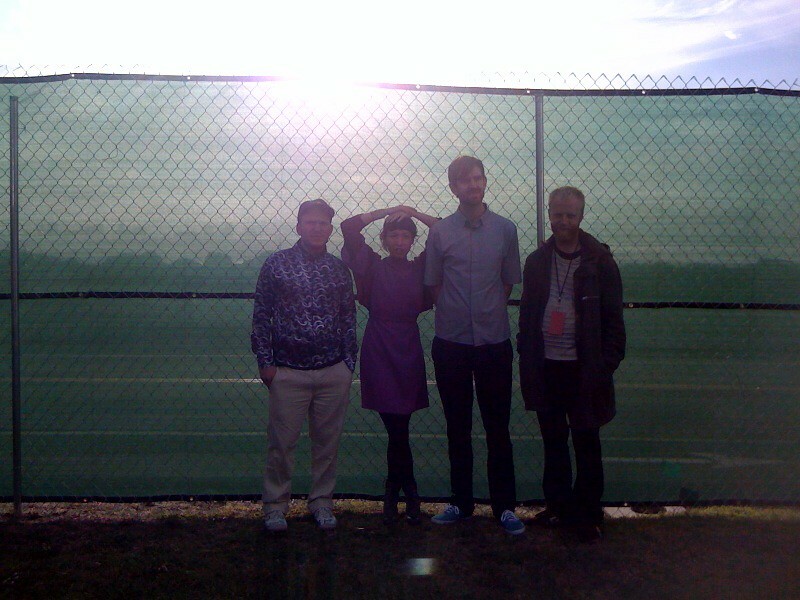 San Francisco-gaze is alive and well with the group Moonbeams. With a full length debut entitled The Daisy Chain set for release this June, we are enjoying their EP Radio San Francisco as if Ride never broke up and Hurricane #1 never happened. Frontman Ryan Moonbeam gave us the go ahead to provide you with a link to the EP here. Rumor has it the ‘Beams are planning a small California tour in August, but until then feast your eyes on the monochrome displays and vaguely familiar sounds. Seems like only yesterday we were welcoming news of the Sonny and the Sunsets’ single “I Wanna Do It” while sorting out the wild press hype. This week they have been kind enough to share the B-side to “I Wanna Do It” called “Mr. Lucky.” Reminiscent of Jack Nitzche Lonely Surfer era instrumental pop, and giving more impetus to the B side's existence by reserving it for further instrumentation, sans vocals. A display of class, conscious and pure San Francisco ‘Sunsets. Then there is Tyler the Creator’s inspirational boy James Pants who has a self titled album coming out May 3 on Stones Throw. There’s a lot of excitement surrounding this release, seems like this Pants dude really gets the process of emulating influences without James Murphy-ing it into recapitulated iPod culture ready LCD Soundsystems. Pants makes a happening through channeling, say, a love for 70s Suicide while flipping forward through the decades and creating a sound that’s keys buzz with contemporary resonance. Listen to “Darlin” and you too might understand. And as a way to return the favor for Tyler’s acclaim, James Pants does this intense, slowed down vocal remix of Tyler’s “Seven.” A touch different from Toro’s re-envisioned remix, eh? Mellowhype will release the Blackenedwhite LP sometime this summer and Bass Drum of Death’s GB City is due April 12, both on Fat Possum. And did you see the video by E-40’s son Droop-E “Loaded” where E-40 makes a cameo? It’s like pops crashing your house party when you thought he was on a business trip only if your dad was in fact, you know, E-40. We were talking not too long ago about Girls Names’ side project Sea Pinks and months before that their Captured Tracks 12-inch, their Tough Love Records 8 track “mini album”, and their Slumberland split 7-inch shared with San Francisco's dazzling Brilliant Colors. Their upcoming Dead To Me evokes the ghosts of their numerous indie forbearers while touting the gray morning'd New Sound of Young Belfast, if you will. Here we get to feast our eyes and ears on the video for “Bury Me”, shot on early 80s television-standard super VHS and reminding you of your favorite Scottish outfit or midland eccentric. So what the hell is going on with front guy Daniel Blumberg from Yuck? Seems like all the buzz, over-exploited blowout SXSW shows and blogosphere reach-arounds has got him taking it easy and making come down music on a Rhodes piano as Oupa. Perhaps this is the soft-sided supplement to the band’s own fitted and decidedly retail marketing-friendly brand of “indie” pop. Shoot, you can even catch that Daniel dude playing “Forget” on piano in his living room in this video. In case you didn’t know how important he is from his day job, his repetitive build up keys will give your heart strings a tug job you haven’t experienced since you discovered alternative uses for tissue paper. Well, homeboy might be on to something here because these blokes are going all the way and making a film out of these “sessions” entitled A Grave With No Name. Here’s the trailer. Decide for yourself if you haven’t already. We welcome the news of the future release of Little Dragon’s highly anticipated Ritual Union this July 12. If 2010 wasn’t a big enough year for Sweden’s non-metal exports, 2011 has them working with Big Boi, making the Late Night Show, earning adoration from KCRW, and heck, we've adored them long before they charmed us at the Treasure Island Music Festival. “Night Light” amps up the drum machines and shows the world that just because they had a stint with the Gorillaz doesn't mean these Gothenburg electro-poppers ain’t has beens or going soft any time soon. I for one am elated with this news.